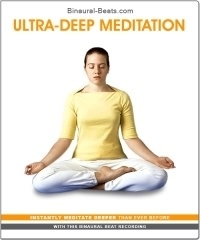 Using the Ultra-Deep Meditation MP3 couldn't be simpler! Like all our binaural beat recordings, simply slip on your stereo headphones and press the "Play" button on your MP3 player. The binaural beats will automatically begin affecting your brainwaves, and you'll soon realize the benefit - ultra-relaxing meditation and pure clarity of mind! Your meditative patience is limited. You simply can't afford to spend every single day meditating for hours on end. Life just isn't like that! But still, some part of you yearns for spiritual utopia, a centered and content inner-self... a state of mind, body and soul that only a master of meditation can attain after years of practice, after years of "settling" and training the mind. Today, however, it's easy. You just get into a comfortable position and begin playing your binaural beat recording. Slowly, your mind becomes more and more still. With most meditation MP3s, you'd be asleep by now... but not this time. You're perfectly aware of the cool serenity of everything, everywhere. Suddenly the world is clearer and your mind is totally calm... this is meditation like you've never known it. It's real meditation, the sort of meditation that takes years to master. After 45 minutes, you feel yourself being lifted. Your spirit, your mood, your entire atmosphere is rushing with power and beauty. The time passed so quickly! And, for once, you can't wait for your next ultra-deep meditation session. It's not a chore, it's a true daily treat! "Amazingly deep... I genuinely feel a more enlightened person. ... And for the first time in my life, I didn't fall asleep meditating!"